If you’re a lover of fashion, you’ll know that when someone says ‘skirt’, you often wonder ‘what type?’. The simple skirt can be split into many different categories, and depending on your shape, you will suit various ones. 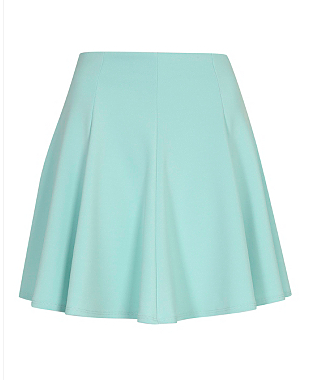 Which skirt do you buy to suit your figure? Here’s a list of five essential skirts that you can choose from to add to your wardrobe. Smaller at the waist and wider at the hemline, the A line skirt is a fabulous addition to any wardrobe and can be as casual, or as dressy, as you need them to be. Available in a variety of lengths, prints and colours, there’s bound to be an A Line skirt out there for you. 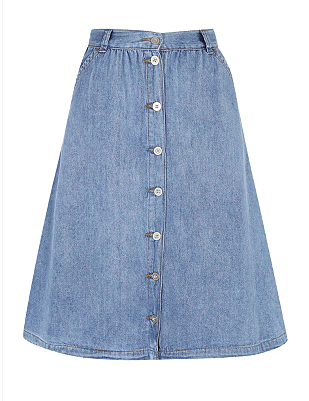 An A-line midi skirt from George, such as the G21 Denim Dirndl Skirt for £14 is a perfect example of a casual skirt that would be perfect for autumnal wear. The maxi skirt is a great way to look and feel feminine, without worrying about the state of your legs. Whether you choose a bold print to complement a plain cami, or a plain skirt with an outlandish top, a maxi skirt is one of the most essential skirts to have in your wardrobe – especially with autumn around the corner. Perfect for those of average height, a maxi skirt elongates the legs and skims past any lumps and bumps, creating a superb silhouette. Aptly named because it looks like a mermaid skirt, the fishtail skirt is fitted at the waist, hugs the hips and tapers to the knees, before it flares out to the floor. 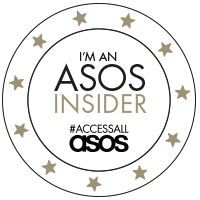 It would be a perfect skirt to have in your wardrobe for the dressier occasions that you may be privy to, such as parties or posh dinners. They can be dressy, or formal, and would look perfect with a gorgeous pair of heels to elongate your pins. Perfect for a casual look, the mini skirt is a great addition to a skirt collection, particularly if you have the legs to carry it off. From spring to winter, the mini skirt can always be brought out of the closet; team with a pair of chunky tights and some knee length boots during the colder days, or flash a bit of skin with a pair of flip-flops as the sunshine emerges, or if you’re heading abroad on holiday. Skater skirts are also a wonderful option, often a little longer than a mini skirt but still above the knee, and with ample fabric to make the skirt appear ‘floaty’. Pencil skirts hug the figure, and usually finish at the knees. Many pencil skirts nowadays are of the bodycon variety, which hug the legs and accentuate the hips and rear. Ideal for formal and dressy occasions, a pencil skirt can look just as fabulous with a blouse or tunic top, as it can with a strappy camisole. Add one or more of these fantastic skirts to your wardrobe for timeless clothing that you can wear again and again. What type of skirt do you love to wear?